Spa Maintenance & Servicing for Private & Commercial Clients. Good Spa hygiene and routine Spa maintenance and servicing is essential to keep your spa in good working order. If you’re looking for a professional and reliable company to provide Spa Maintenance and Servicing, look no further than the AQS Group. With our team of engineers located throughout the UK, you are never far away from an AQS engineer, ensuring a prompt response. Our expert engineers carry standard spares to ensure a first time fix, minimising facility downtime and inconvenience. 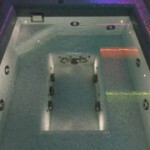 Make sure your clients don’t get “Red-Eye” – let us service your Spa and, if you don’t have one – install a UV! Make sure your filter media, (usually sand), is inspected yearly and changed as required. Balance Tank Cleaning and Disinfection (where installed) is mandatory every 12 months. For peace of mind, contact AQS and arrange an appointment for one of our engineers. For more information on Spa Service & Maintenance please contact us.